Asgard has fallen. As foretold in the Ragnarok Prophesy, the cataclysmic battle between the Norse Gods of Valhalla and their enemies has been fought. Odin, Thor, and all the others have been defeated, and their spirits now dwell in Niffelheim. Their most powerful enemies perished as well - Fenris the Wolf, the Midgard Serpent, and the greatest of the Frost Giants. Now their names are evoked only as empty curses. But what follows Ragnarok? Who rises from the ashes and anarchy left by the fall of the Norse gods? 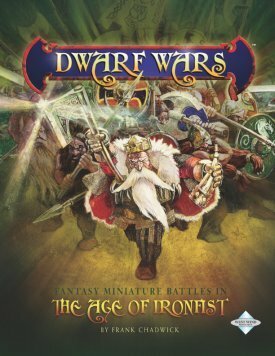 DWARF WARS is a game of conquest and warfare between good and evil in a ravaged world. The battle rules are very easy to learn and fast to play, but they capture all of the demands of command, the importance of the skill and experience of warriors, the advantages and disadvantages of diverse weapons, and the terrible uncertainty of battle. The additional sections of the rules add to the game without changing its basic rules, incorporating magic and the mythical creatures of a fantasy world rich in history and lore.